The Internet is an amazing tool for planning trips. The problem is the dizzying number of options. Many guides and outfitters make claims about their world-class fishing, trophy fish, and years of experience. 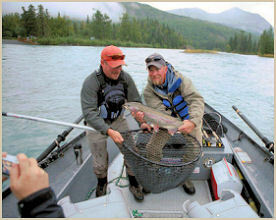 Alaska is a remarkable place and at times and in certain places, just about anyone can catch fish. However, even in Alaska, fishing can be very challenging. An experienced and flexible guide will make all the difference in assuring your trip is successful. If you have questions, you should contact the trip operator. You should expect a prompt and honest reply. What you need to know is that your guide will provide you with the best fishing experience possible given the conditions on the day you book your trip. You should expect to fish from a clean boat and with top-notch equipment that is in working order. You should expect the guide to be on time, safe, professional and to give 100% effort in making your trip a success. Guiding means more than providing a boat ride down a famous river. With Mystic Waters, you will fish with an experienced, professional and personable guide who loves to share his knowledge of the river. Catching fish is the mission and no effort will be spared in the pursuit. Learning new skills and enjoying the trip is of equal importance. We take pride in the details and in providing personal service. WHY YOU SHOULD HIRE A GUIDE? If you think a guided fishing trip is expensive, tally the costs of doing it yourself. First, you need to buy or rent your boat. Then there are maintenance issues and transportation logistics. You will need the rods, tackle and lures or flies suited for each location, technique and species targeted. Then there's the time involved in educating yourself about how to use what you have to catch fish. If you really want to learn how to fish well, enjoy your time on the water, and ensure the success of future do-it-yourself trips, a guide is your best investment. Consider it tuition. If you only go fishing several times each season, your time is very valuable. 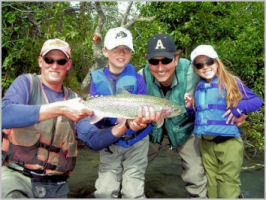 Join a guided trip and just fish. I wanted to send you a thank you note for the wonderful four days of guided fishing. You guys worked hard and put us on the fish. I simply cannot say enough about the quality of the trips you provided. You both know the river better than I ever could have imagined. You provided wonderful equipment, boats. Your methods with fly choices, gear, etc. were perfect. Fred has x-ray vision in that silted water and can see fish no one else can. Stacy has a wonderful sense of humor and could catch fish blindfolded with one hand tied behind his back all day long. You both are talented oarsmen and I was particularly impressed with the effort you all were willing to put into fishing a technically challenging area. Both of you put us right on the seams where the fish were. We caught way too many BIG fish. 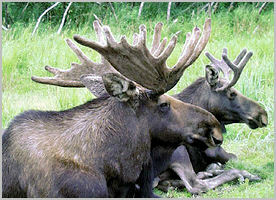 But most of all, both of you exhibit a profound respect for the wonderful Kenai River and its inhabitants. Your knowledge of flora and fauna was impressive and all of your techniques were designed to co-exist in, and not infringe upon, this very special place. You worked hard when the fish were hitting and harder when they were not. You both are studio artists when it comes to displaying and photographing the catch. Finally, you did a wonderful job of making complete strangers feel like your friends in a comfortable, charming way that allowed me to get the most out of my time on the river. This was a vacation. This was the best guided fishing experience I have ever had, bar none. Thank you both for a wonderful time.